The Tryp Itaim hotel is located in Itaim district, one of the best areas of Sao Paulo, offering a Wide range of restaurants, bars, movies, museums, etc. Just 20 minutes distance from the city center with the popular Avenida Paulista and Avenida Luis Carlos Berrini. 15 minutes from the local airport Congonhas, and 45 minutes from the International Airport Guarulhos. The hotel offers 142 Rooms, with Fully equipped bathroom, Air-conditioning, Cable TV, Telephone,High Speed Internet access (Free),Desk, Radio/Alarm Clock, Mini-bar, Safe Deposit Box, Magnetic key card and 24-hours Room Service. The hotel's gastronomic offer includes the "Bonjardin" Restaurant, serving international specialities, offers breakfast, lunch buffet-service and dinner a la carte. There is also a Lobby Bar. 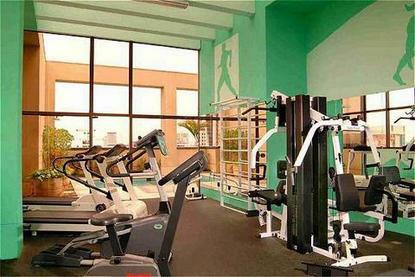 The hotel has a gym and a pool with panoramic view for those moments of leisure. It also offers a wide range of services and facilities for all the guests: Business Center, High Speed Internet Access and Garage. The hotel boasts 7 Meeting rooms for up to 80 persons. Highly qualified personnel and the latest in audiovisual equipment.